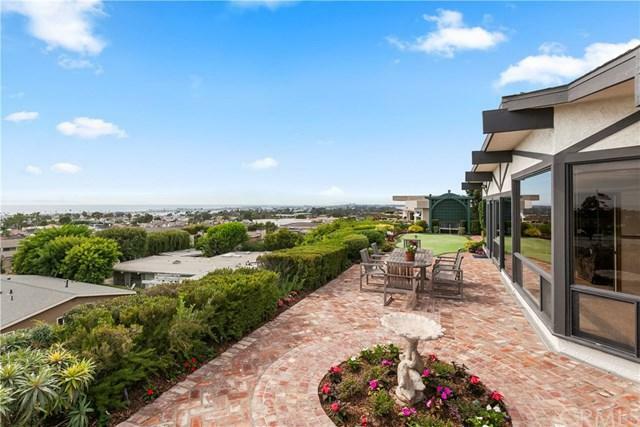 Located in a premiere location along prestigious Harbor View Drive, this classic single level English Tudor offers panoramic ocean, harbor, Catalina and 180 degree city light views from nearly every room. This immaculate property has been extremely well cared for inside and out. Features include used brick and hardwood flooring, high beamed ceilings, center atrium and four fireplaces throughout the home. The spacious kitchen with granite counters and stainless steel appliance package (including Viking built-in refrigerator and 48" Wolf range) is ideal for entertaining family and friends. An oversized master suite is highlighted with a gracious sitting area, romantic fireplace and walk-in closet. The master bath was recently remodeled to include a glass-enclosed walk-in shower, separate claw-foot tub and large vanity with two sinks. The private front courtyard is complete with a built-in bbq and mature landscaping. In close proximity to Corona del Mar's Village, Fashion Island's shops and restaurants, John Wayne airport and some of Newport's finest beaches, this lovely home is ideal for any buyer looking to enjoy Orange County's highly sought after coastal lifestyle. Based on information from California Regional Multiple Listing Service, Inc. as of 2019-04-19T00:38:36.993. This information is for your personal, non-commercial use and may not be used for any purpose other than to identify prospective properties you may be interested in purchasing. Display of MLS data is deemed reliable but is not guaranteed accurate by the MLS. Licensed in the State of California, USA.This information is deemed reliable but not guaranteed. You should rely on this information only to decide whether or not to further investigate a particular property. BEFORE MAKING ANY OTHER DECISION, YOU SHOULD PERSONALLY INVESTIGATE THE FACTS (e.g. square footage and lot size) with the assistance of an appropriate professional. You may use this information only to identify properties you may be interested in investigating further. All uses except for personal, non-commercial use in accordance with the foregoing purpose are prohibited. Redistribution or copying of this information, any photographs or video tours is strictly prohibited. This information is derived from the Internet Data Exchange (IDX) service provided by San Diego MLS. Displayed property listings may be held by a brokerage firm other than the broker and/or agent responsible for this display. The information and any photographs and video tours and the compilation from which they are derived is protected by copyright. Compilation © 2019 San Diego MLS, Inc. Licensed in the state of California.